There are thousands of gadgets out there that will be great for your RV. Some of which are really useful and others are just plain pointless. However, this article will hopefully help show you all the best helpful gadgets currently on the market that you’d be a fool not to have. This section will discuss what sort of things you should be looking for when finding these helpful gadgets. It will help you distinguish between what is useful and what’s just there to steal your money. Something that impulse buyers often struggle asking themselves, ‘do you need it?’ If you think that this gadget can genuinely offer you a great service, fix something around your home or even just save you time and effort, you should get it. However, if it’s something that you think is just cool but isn’t really required, don’t bother getting it. Most of the time people just go ahead and buy something out of interest and then end up regretting it once it arrives; very quickly all those bad reviews on Amazon start to make sense. Always keep an eye out for products that don’t have raving reviews left on their website. You should always check the price of the gadget on multiple sites and see if there are any deals or special discounts that you could benefit from. There are also going to be multiple different models of the same gadgets which could also impact price. This section is one of the most important parts of this article, this is where we’ll discuss in greater detail the various features, pro’s and con’s of all the best RV gadgets currently on the market. This fridge brace is without a doubt one of the most helpful gadgets you’ll have the pleasure of using. You simply use these two brackets to hold your food in place so that it doesn’t fall around and spill during driving. This product are like bookends but for food and drinks in your RV. You’ve probably had to clean up your fair share of spills over the past few years while driving in your RV, this product stops this from happening. Although they’re really simple, they work so well. 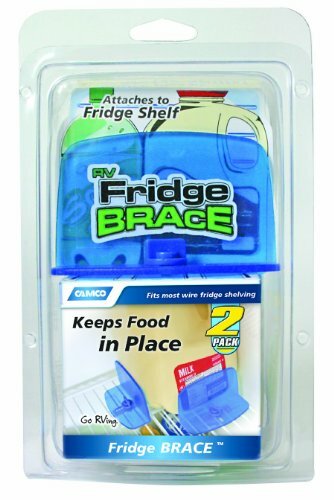 This product is obviously very helpful for anyone travelling around in their RV, it keeps your food in place and stops liquids from spilling over your fridge; what else could you want? These brackets act like bookends but for food and come in a pack of two, they’re made from plastic which isn’t a problem. However, sometimes like all great products they do just stop working. If you’re using these to hold into place a few items that are heavy or full, the weight of those items might be enough to just slide these brackets out the way and just spill anyway. Regardless of the occasional spillage, these brackets are a great idea and work really well. WIFI is really important for anyone who travels around on their RV, it’s crucial for working remotely which is a huge part of how RV’ers survive. This gadget works by enhancing the WIFI signal of your laptop or computer once it’s plugged into your device. This is a 2.4 GHz boost that is long range with a 16ft USB cable. The device is also IP65 waterproof and dust resistant with an anti-UV and anti-corrosion protective coating. You also have a few mounting features like the detachable tabletop tripod, adjustable metal stand and velcro strap. This product can be used on any Windows laptop. 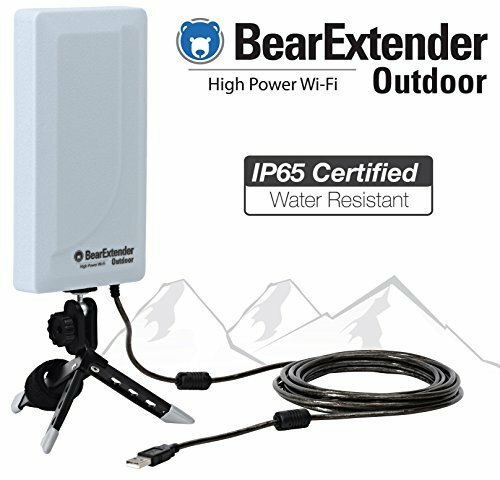 A WIFI booster is a great idea for anyone that needs a decent signal while travelling around in their RV. Thankfully with this device you receive a 2.4GHz boost. You can find the best spot for the device and sit comfortably by using the 16ft cable, you could even sit outside and enjoy the sun while your booster gets the best signal. It’s also waterproof and dust resistant, this can be great if you only travel during the summer months. The only downside to this product is that this model isn’t compatible with Mac IOS or any tablet devices, it’s very limited to anything before Windows 10. Travelling throughout the winter months can be a freezing experience, having that extra help from a portable heater can make all the difference. This heater has an adjustable thermostat with a digital display which allows you to play around with what temperature you want your RV with the easy read digital display. The heater can also be controlled from the remote control, things like the built-in timer allow you to easily set up heating times of up to 8 hours with 1 hour intervals. For anyone that is cautious about these devices, they have built-in safety features that will protect your device from overheating and will never burn your hand with the cool touch exterior. This product is great for being flexible and working to your conditions, it has an adjustable thermostat that you can play around with for the perfect temperature. The digital display makes it easy to monitor and customize. The timer can also be set to have the heater work for up to 8 hours with one hour intervals in between. All of this can be controlled from the remote control which is really convenient for any RV owner on the road. The only downside to this product is that it’s only 1500 Watts which means it can only cover a small area within your RV, it’s best used in the bedroom. Wheel chocks are used to make sure your RV doesn’t drive away without you. These particular chocks are of a different design to the standard blocks of wood you might see being used. This model works by applying force to both tires at the same time, locking them in place. 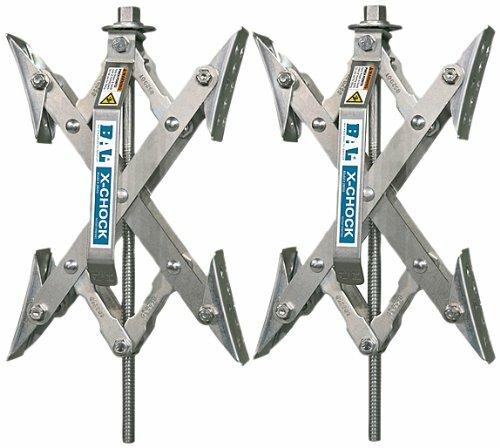 This chock uses the tires natural movement rather than opposing that force, making them more secure. These chocks can retract to a tiny 1 ⅜ inches and extend to over 12 inches. They’re also great at staying clean with their rust protective coating. These chocks are an entire different design from your traditional wooden block chocks. By using the opposing natural force of each tire, you’re really minimizing the strain felt on these chocks which allows them to last far longer. They can also retract into the smallest of spaces and extend up to 12 inches away, making them really flexible and great to work with. Without a doubt, these chocks will most likely be in use during a storm or rain shower at some point in their life, the rust protector will help protect the gadgets from the elements at all times. The only problem with these devices is that because they rely on two tires being within 12 inches of each other, you can only really use them on RVs that have 6 wheels or more. 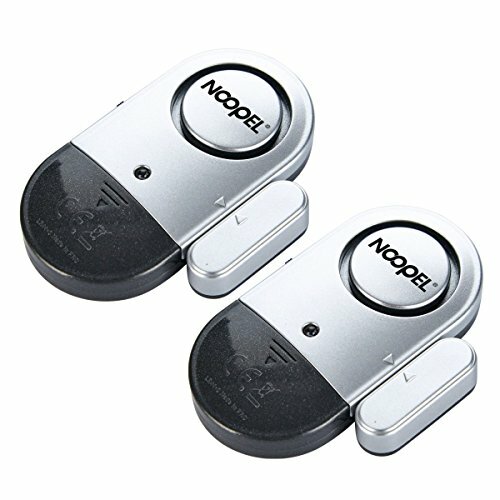 This security system is a magnetic window alarm sensor that has the ability to set off an alarm, producing the same noise level as a thunderclap. This terrifying alarm will prevent your children from leaving the RV without you noticing and will stop anyone from entering your house unexpectedly. The super thin alarm is easy to set up as there’s no wires needed to hook up; all it takes is for you to stick on to your door or window with the double sided tape. This product is extremely sensitive so you’ll be assured that it’ll catch everything that moves within its range. This security system would be perfect for your RV. It’s small, compact and really easy to set up. The super sensitive alarm will produce 120 dBA of sound that’s the equivalent of a thunderclap. With no wiring or screws needed, you just have to use the double sided sticky tape and apply to your door or window. It really is that simple. The only downside to this product is that if you know where the on/off switch is, it can be disarmed fairly easy. If you’re not using it as a security system, you could place it on the fridge to help your partner lose weight. A GPS is an incredible device and is really important for many RV lovers out there that can’t read a paper map. This product is one of the easiest to use and understand GPS’s on the market currently. Not only is the UX incredible; you also receive the product as part of a kit, including a 12V car charger, a pocketpro hardshell case, a bamboo stylus mini, microfiber cleaning cloth along with three LCD screen protectors. You can access a range of features built into your GPS like all the known RV campsites, service stations and multiple different categories that you can choose from. This product is one of the easiest to use GPS devices currently on the market, you can access a plethora of features that wouldn’t be available on your standard car GPS like the various RV campsites throughout the US. 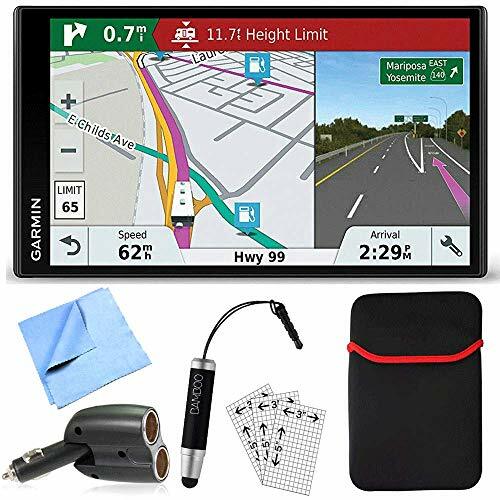 The product also comes as part of a kit that includes various items to help maintain the GPS like a microfiber cleaning cloth and screen protectors. The only downside with these products is that you’ll need to update them regularly to compensate for new roads or areas being constructed. Cookware is something that all RV owners should have plenty of, you never know when you might need bigger pots to accommodate the neighbors. 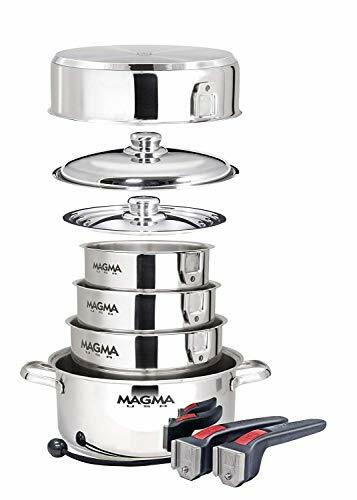 You should always have a decent, reliable set of cooking equipment and there’s nothing better than a stainless steel set. This kit comes with three saucepans; 1 ½, 2 and 3 quart, with interchangeable lids, a 5 quart stock pot, a saute/frying pan 9 ½ inch in diameter with two removable handles and a storage cord. All of these pots and pans can be stored within each other like russian dolls. They’re also triple-clad bottoms for an even heat distribution. There are plenty of benefits that come with a stainless steel set of pots and pans like the durability. These pots will last you a long time if cared for and looked after. You receive various pieces of kit which is more or less everything that you need to cook. What really makes these durable and reliable is the triple-clad bottoms that will evenly distribute the heat throughout the pan. The only downside to these products are that the handles that are supplied can easily fall off if you don’t screw them in properly. Shower Heads are crucial in making sure you have a clean and comfortable experience when showering. This high pressure handheld shower head has a brushed nickel finish which retains this design for years after. It turns that low pressure pipe into a powerful spray by using internal components to increase the water pressure. The turbocharging shower head will mix both oxygen and water to both increase the water pressure and limit the wastage. The Silicone rubber nozzles will prevent any build-up of grime and bacteria, if you do spot any particles you can easily clean it off with your fingers. 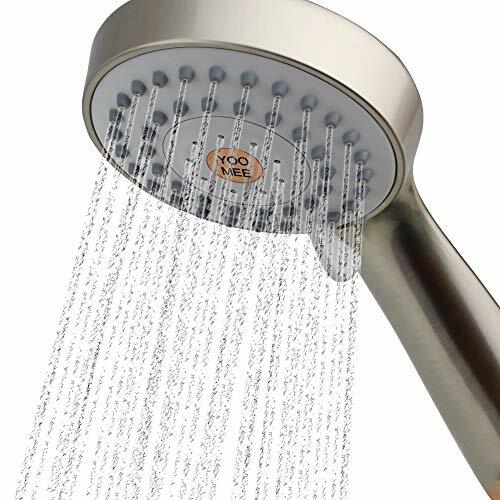 The actual body of the shower head is constructed from durable ABS plastic which is used in all types of high quality products. This shower head will offer a great range of benefits from high water pressure to a strong durable ABS plastic that limits any damage. This product is great for conserving water which is a main priority for many RV owners, they don’t want to be using up all their water within the first few days. This product also maintains itself thanks to the silicone and rubber nozzles that limit any bacteria or growth buildup, it’s also just as easy to rub it off with your finger. The material used to construct this shower head is mainly ABS plastic which can survive almost any bump or years of continuous use. The only problem is that the stainless steel handle that is supplied will begin to rust after a few weeks if not taken care of. This tire inflator is great for using on any RV, it’s a 12V device which you can easily plug into your dashboard to operate. The pump offers 150 PSI max working pressure. It doesn’t really matter how big your RV is, because this product has an air hose length of 35 ft with a CFM of 1.80 which will supply a constant, steady flow of air. The whole process is fairly easy thanks to the easy to use inflation gun, which includes an automatic shutoff function for emergencies. The quick connect inflation hose and pressure gauge make the whole process even easier as it’s more or less effortless to begin and monitor the whole process. The device also comes with a smart carry bag and an anti-vibration tray that limits the noise and damage caused because of the vibrations. 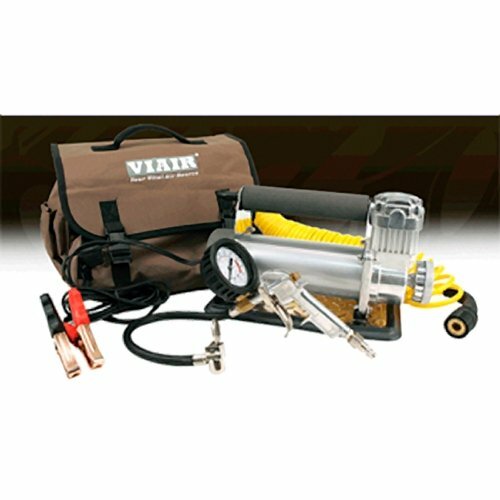 This is truly a top of the line tire inflator, it can produce up to 150 PSI at a rate of 1.80 CFM which is a great rate to pump up your tire, you’ll be done in no time. The PSI makes it possible to inflate even some of the biggest RV tires on the market. The 35 ft long hose also helps with any larger RV’s. The inflation gun makes the whole process more accurate by having the user directly control the rate at which the air flows into the tire. The anti-vibration tray also limits the damage caused by the constant rattling from the device. The only problem is that if you ever hit the gauge off something by accident or even go over a pothole and the gauge isn’t protected, it could mess with the internal components making the device inaccurate. This special formula will help protect your RV from UV rays and other extreme elements. The long lasting polymer formula offers protection and deep gloss finish to fiberglass and gel coat surfaces, which so happens to be the material that the majority of RVs are made from. This secret blend will help you retain your RVs brand new look. It can even remove light oxidation and scratches by acting as a protective layer. 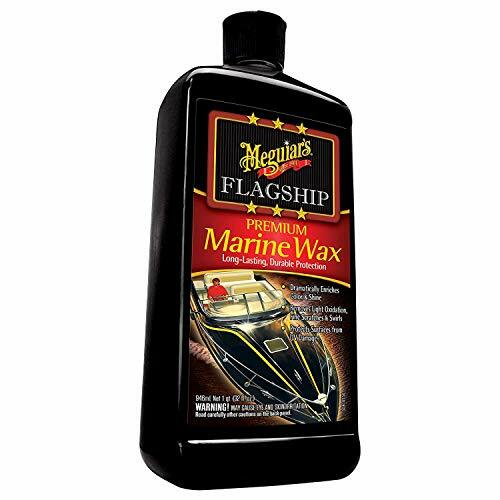 The wax will enhance the color and shine of your RV making it better than when it first came off the factory line. This product uses a polymer blend that acts as a great protection against UV rays and scratches. The benefit of polymer is that it’s great at what it does and will fight tooth and nail to remove light oxidation and scratches. The secret blend can help enhance the color and shine of your RV making it look just as good as the day it came off the factory line. This product is also waterproof meaning no amount of water will be able to remove it for weeks on end. The only downside to this product is that it has a health warning from California as causing Cancer and reproductive harm, so you might want to take some precautionary steps before using this formula. There are thousands of different types of gadgets that you can buy for your RV, it would be impossible to list them all. However, we’ll mention some of the most important and popular currently on the market. This gadget is essential for your RV to be looking constantly brand new for years on end. The way it works is by adding a protective layer between your RV, sun and the elements. Constant sun exposure can be damaging to your RV by discoloring the roof and external areas which then makes it look old and damaged. Wax will work to stop the damage it creates. Shower heads are something we use on a daily basis or at least we should be. These devices help us get clean and enjoy ourselves during the process. The way they do this is by ensuring the water pressure is suitable for a relaxing and comfortable experience. They also make sure that you can control the flow of water which ultimately dictates how much water you waste. A decent shower head is a great investment. Another important gadget is a WIFI booster. What would happen if you just didn’t have WIFI? You’d be lost, you’d have no way of communicating other than your phone. You’d not have anyway to work from the road either, which is a huge part of an RVers lifestyle. So, it’s really important that you have the best WIFI possible and from anywhere within your RV. So, a WIFI booster is important to have a strong signal. No more glitchy Skype calls or long lasting YouTube loading. It’s safe to say that there are thousands of gadgets out there all from hundreds of manufacturers and brands. However, only a handful of these gadgets actually work and only a small minority of those gadgets are actually useful. The list we’ve provided here are a handful of those gadgets that every serious RVer should consider buying as they make life a lot easier while on the road. Best RV Thermostats of 2019 – Digital, Duo Therm, Dometic, & More!